The pacman.drl is starting to shape up, I just added in the additional logic to have pacman slow down during eating. The example is starting to show the value of using a rule engine and hopefully I can use this to explain the interesting characteristics of Rete network and node sharing. Originally I had just two rules, one that detects when pacman eats normal food and another for when he eats a power pill. I then added a third rule that has monster collision detection. That rule only shares the first pattern. While in the current set of rules only the first pattern is shared here, actually this rule has a larger set of sharing with rules in other packages. Then much later I thought about the logic to slow pacman down and added that. What I like about this is I was able to think about this logic in isolation, without worrying about the other rules. The first think you'll notice is there are 4 black terminal nodes, yet we have 3 rules. That's because of the 'or', remember an 'or' conditional element actually uses a series of logic transformations to remove the 'or's and instead replacing them with rules that represent each possible outcome - all resulting rules are independent of each other and can match and fire, so be careful as this does not have the same behaviour as an pattern infix '||'. The leftmost blue alpha node (1) constraining 'name == "pacman"' is the root node for all rules, so it's tested once and true for all for rules. 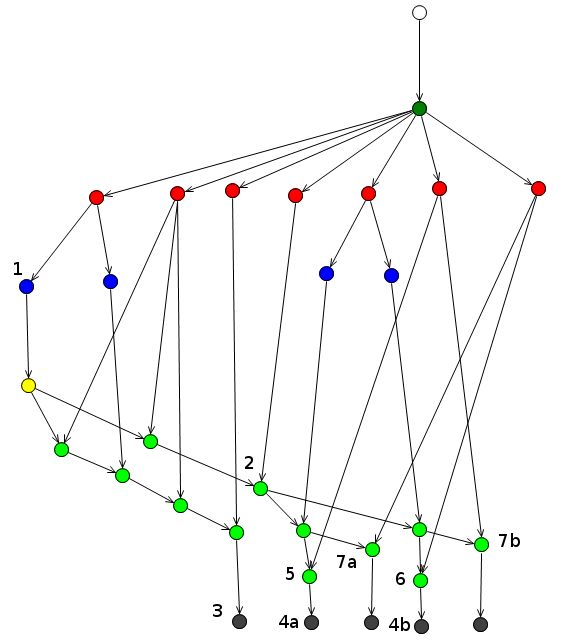 The connecting yellow node is the left input adapter, which is necessary for the first pattern to allow it to propagate to the green beta nodes. 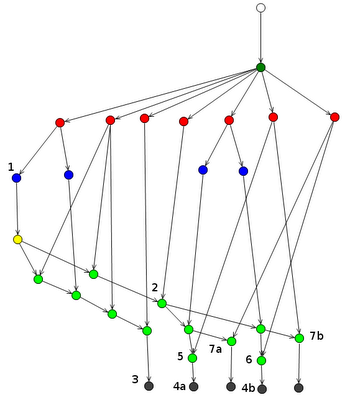 Terminal 3 is the "MonsterCollision" rule, other than the first shared node, notice that all other patterns, represented by the green beta nodes, which are of the join node type, are independent and exclusive to that rule. That's because the sharing only happens while the sequences of patterns are the same from the root pattern, once the split occurs the network stays split. Finally you'll notice 7a and 7b, which refer to the Score pattern of the "EatFood" and "EatPowerPill" rules. I hope that has given a bit of insight into both Rete and beta node sharing works as well as the current Pacman implementation. Should we rename Drools Solver to Drools Planner?